Analyze. Visualize. Engage. These are fundamental tasks of urban planners as they seek to promote informed, collaborative decision-making about the future of cities and regions, large and small. CommunityViz® software is here to help. 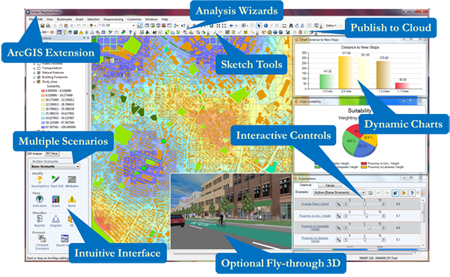 Working as a seamless ArcGIS® extension, CommunityViz provides an advanced-yet-accessible framework for planners and citizens to learn and make choices about the future of the places they love. Feature-rich, versatile, well established, widely used, award-winning, and famously people-friendly, CommunityViz is the software no planner should be without. Bring your map to life with Scenario 3D, the ArcGIS Desktop extension that lets you create beautifully realistic, interactive, sharable 3D scenes. Walk through or fly over your project site. Go anywhere and look anywhere. Click on objects to learn more about them or hear them "talk." Get a "feel" for the place. It's a whole new level of communication and understanding. And it's easy. In more than 40 countries around the world, thousands of people are using CommunityViz. They represent the smallest towns and largest cities, private consultants, NGOs, federal and state agencies, counties and regional planning authorities, local and national consultancies, Native American tribes, and the countries' leading universities.